Begin your adventure as you travel to a secluded lake by motorcoach. 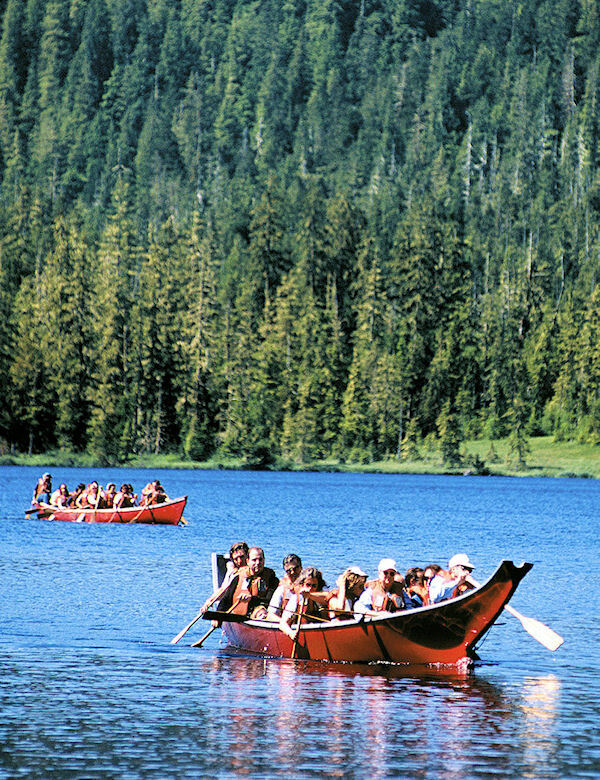 Upon arrival you will board a 37-foot Indian style twenty passenger canoe, which is fast, stable and easy to maneuver! Paddle under the direction of an experienced guide, scan the shore for wildlife, and learn the unique natural and Indian history of the Ketchikan area. Experience what it was like for the original explorers! The lake, a part of the lush rain forest, is surrounded by the National Tongass Forest, one of the largest in the United States. We will stop ashore for a native-style snack including smoked fish, clam chowder, rolls with wild berry jams, and beverages. A knowledgeable guide will lead a short nature walk, highlighting the flora and fauna of the rain forest, including such features as carnivorous plants. Paddle back to the canoe dock where you will board your motorcoach and return to the cruise ship pier. Suitable for all ages and no prior experience necessary, just good health and an adventurous spirit. Children, 12 and under, must be accompanied by an adult. Children must weigh at least forty pounds in order to fit into required life jackets. Souvenir T-shirts are available for purchase. Some final notes: bring your vouchers and dress comfortably for the weather (if your tour is on the water it will be about 10 degrees cooler.) Camera and binoculars are suggested for land-based tours. However, while on tours involving rafts, canoes and kayaks, we suggest you bring disposable cameras. The specific meeting location at the pier will be listed in your confirmation email and voucher for this shore excursion.